Brent McDonald, reader, with son James and daughter Abigail. Good afternoon. My name is Brent McDonald and I am here with my father Doug McDonald of Crieff, Puslinch. I am the grandson of James and Donelda McDonald who are buried here in this cemetery. My Grandfather, Jim was the brother of both John and Donald McDonald, my great-uncles, who I will be speaking about today. I am very honoured to be part of this event, to share and learn more about the history of these lives and how they contributed to the stories and fabric of this great township of Puslinch. While both John and Donald have their names on this stone in Crieff Cemetery it is important to note that this is just a memorial stone. This stone was commemorated after the war in a ceremony where approximately 45 members of the Highland Light Infantry Association came to honour the death of these two brothers and others from the district who passed in the two world wars. Both Donald and John were killed in the bitter offensives of 1944 in the Second World War. Donald is buried at Inglevert, Calais France and John is buried at the Belgium Military Cemetery in Adegem, Belgium after being killed in action during the Battle of the Scheldt in Holland. Both brothers would be honoured and comforted to know that their names are immortalized here in Crieff among family, friends and many other contributors to Puslinch’s past. In 2004, cousins of ours visited both gravestones of John and Donald and pictures of their final resting places are here in these envelopes. The first set of pictures shows the records in the Belgium cemetery and denote John as a class H Warrant Officer of the Highland Light Infantry of Canada. He died on October 9th, 1944 at the age of 29. The second set of pictures are taken at the Calais Canadian war Cemetery where Donald’s credentials as a Class II Warrant Officer of the Highland Light Infantry of Canada are noted. Donald was killed in action on Sept 2 1944 at the age of 26. Both brothers died at the end of some terrible fighting during the summer of 1944 where many offensives had taken place. As with all of our soldiers who fought serving their country they demonstrated considerable courage and bravery. For his efforts Donald received the Belgian Croix de Guerre avec Palme. The following excerpts describe the honours that were bestowed upon both John and Donald. The posthumous decoration of the Croix de Guerre, 1940 with Palm has been awarded to the late Company Sergeant Major Donald Russell McDonald of the H.L.I. of C., better known to his comrades of Galt’s Own Battalion as “Dixie”. The beautiful bronze medal was received recently by his parents, Mr. and Mrs. Kenneth McDonald of R.R. 2, Puslinch, along with a certificate from Major B.E.M. Ducq, military and air attaché of the Belgian Embassy at Ottawa. The Certificate is in the Belgian language. The late hero of the H.L.I. lost his life on Sept. 2, 1944 at Abbeville France, while his brother, John I. McDonald, also a company sergeant major with the H.L.I. was killed in action on the first day of the Canadian invasion of Holland, Oct. 9, 1944. He was cited for bravery on the battlefield. Accompanying the Croix de Guerre and Palm was a letter from Major General E.G. Weeks, Adjutant General, who writes: “It is with a feeling of pride that I write on behalf of the Minister of National Defence and all ranks of the Canadian Army to inform you that the Belgian government has been pleased to confer the award of the Croix de Guerre, 1940 with avec Palm upon your son the late A37676 Warrant Officer Class II (Company Sergeant Major) Donald Russell McDonald. This award was granted in recognition of his outstanding contribution toward the liberation of Belgium in the Second World War. To assist with farm life families were often larger than we see on average today and the McDonald brothers were no exception. There were 8 brothers in total in the McDonald family. Four of the brothers enlisted as soldiers although the War ended prior to the youngest brother Stuart McDonald leaving for overseas. Ivan joined the Winnipeg Grenadiers in 1942 and went overseas as a Captain in 1943 before returning safely in 1945. The roots of my ancestors are well documented thanks to the work and research of a distant relative, Jean McDonald Anderson. From her research we know that John and Donald had 6 other brothers and Ken McDonald and Annie Ingram were their parents. Ken and Annie farmed at the south end of Puslinch Township. Ken was born on October, 7 1876. His parents were James McDonald and Marjorie McPherson. James was the first ancestor to come to Canada at the age of 3 years old. His father John McDonald, born in 1803, brought his family to Canada from Kingussie, Scotland. I can only imagine the arduous and adventurous stories these families lived carving their homes, farms and lives out of the bush of Puslinch. We do have the privilege of getting a glimpse into the lives of Ken and Annie McDonald, parents to John and Donald through wartime letters that were sent informing the family of the death of their two sons. I’d like to finish today’s talk with excerpts from these letters. The first letter is written from John to his brother Stuart and is the first letter sharing the sad news of Donald’s death. Stuart read all this before you speak to anyone. Well Stuart, here’s hoping you have turned into a good soldier since you have been in the army for here is some pretty tough news for you to break to Dad and Mother. Donald was killed in action yesterday at around 3 o’clock with a shrapnel wound. He died almost instantly and I was only a few hundred yards away, but he died before I got there. I am writing you this because I do not want Mother to get a shock like this when she is all alone. I am counting on you Stuart to handle this in the best possible way you can. If you are aloe when you read this it would be a good idea if you stepped over and got Mrs. Hobson to come over with you to tell Mother as Bea will help Mom a lot. Now Stuart, I am going to wait and write Mother and Dad tomorrow so as this letter will get to you first, and you can tell the family ad give everyone my deepest regrets, but I think I understand a little better than you folks in Canada, but I can assure you all he was a fine soldier and a great C.S.M. We had a nice funeral last night at 7:30, and the French ladies piled Don high with flowers, and he is buried in a nice little civilian cemetery and they vow he will never be without flowers on his grave. Captain Hancock came with me to the grave and the Colonel came too, and they were all pure white to me and did everything they could to help. Well Stu, this is pretty near all for now but will write Mother tomorrow. Hoping you can put this over to the folks without too much grief and don’t let them worry about me. The second letter is written to Annie McDonald from George R Hancock, the Captain of the Highland Light Infantry of Canada. George R. Hancock, Capt. H.L.I. I must apologize for the long delay in writing this letter to you. Part of it is my fault and part is due to the fact that I have been away from the Regiment for four weeks. I understand that you have not heard the full details concerning John’s death, and perhaps it is fitting that I should give them to you. Both your sons had many good friends in the Regiment. But as far as I am concerned, John McDonald was the best friend anyone could wish to have. And now that he is gone, I consider it an honour to have lived and worked with him – even for such a short time. Maybe it is one of the blessings of war that companionship I found upon the comfort there is to be found in realizing the physical presence of another. And that companionship is never taken for granted. I shall never forget the many times when John was doing a job in the midst of danger and the relief I felt when the job was done and I found him there still safe. There was the night of Buron. I went up to take over the company and all that was left of the gang we knew so well were 43 men, and John acting as company commander. And there were other times when my own courage faltered in the face of danger, but the fact that John was around as usual doing his job – and quite often much more than his job – seemed to indicate that thinks would be alright. Throughout the five months we were together in France and Holland, it became more and more difficult to stick with it as our friends gradually left, and I like to think that at times when John felt great sorrow at the loss of another old friend, perhaps my presence helped him carry on. And that’s the way our friendship grew. After so much danger I felt sure he and I would see the war out. Then we landed in Holland. The first day of the Scheldt pocket fighting, we came in from the landing craft and followed the company up a very flat road which was under very heavy enemy fire. John was with the Bren Carrier as usual and I was with the jeep. We took shelter I a farm about t hundred yards behind the company who were fighting in another farm. A runner came back with orders for me to remain where I was but for the jeep to bring ammunition and pick up a casualty. John went up with the jeep. About ten minutes later the jeep came back with John lying on the stretcher. We transferred him onto the carrier for the trip back to RAP, but when we had placed the stretcher aboard, I looked at him and saw that he was dead. The lad who came back with him said they had been standing by a slit trench when an enemy sniper fired from about 600 yards away and John was hit in the chest. I guess he must have died while he was being placed on the stretcher. There isn’t much more that I can tell you. The fighting was long and intense after that so I was not able to attend his funeral. I am not sure just where he is buried, but I expect to go back that way some time in the near future and shall perhaps have an opportunity of locating it. So far I have only mentioned my own feelings about John’s death. And before I end this letter I must not neglect to tell you what a great loss his death is to the H.L.I. You have every reason to be most proud of both your sons. Reinforcements always arrive, but the Battalion can never find replacements for Dixie and John McDonald. 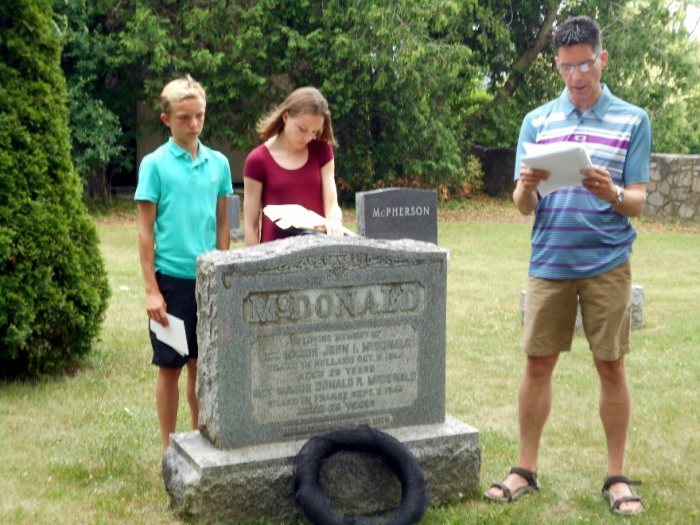 I’d like to express my thanks and appreciation to the Puslinch Historical Society for their commitment to these Spirit Walks and to keeping the stories and memories of past figures in this Township alive.